Read on below for my live-blog post on ‘Helga Nowotny on the promise of science’. Live-blogging from the Nobel Dialogue conference was a new experience for me—the aim being to sit through a lecture/dialogue, digest the information, write a coherent and constructive blog post and then publish before (or while) heading to next discussion. Despite some thorough research prep ahead of the first day, and reading plenty of live-blogging advice about battery power and staying hydrated, I managed to arrive in the auditorium totally dehydrated, and proceed to deplete my macbook battery in 90 mins. Thus, my first post was executed by mobile phone on WordPress for mobile and submitted by sacrificing my attention to the next talk. Fortunately, the nice thing about having a team other other bloggers is that you know they have the next talk covered. The real struggle was doing likewise in the panel discussions. The panels consisted of five/six eminent thinkers, expertly moderated by Matt Ridley (for Genetics in Agriculture and the Environment) and Adam Smith (for The Promised Land of Genomic Medicine); however, despite excellent moderation, you’re still left with the task of weaving multiple streams of consciousness into a cognate narrative. After the first panel there were roughly five minutes to consolidate four pages of notes into a post and be ready to engage with the next discussion. I just about managed that, but the final panel session still awaits my finished post because, by that time, I was as fried as my macbook. Covering the Nobel Dialogue was, however, a great experience. The organisation and slickness of this conference was superb, and audience participation and access to panelists (especially during coffee/lunch/wine breaks) was unfettered. I’ll write more about my thoughts on the Nobel arena in the coming days, while I finish up posts and overall synopsis. For now I’m cross-posting the first lecture of the day I covered (written on my mobile). Nowotny asks what does a social scientist do in the land of genomic promise? The promise (or contract) that binds science and scientists together is the expectation that the public have from scientists, and the scientists aspiration to produce something useful. The pursuit was one of laws, the laws of natural philosophy, but with the concept of ‘law’ as a term taken from society. Yet the aim was to supersede the laws of society; science promised access to the kind of laws that could not be bent by kings or rulers – they provided truths above the arbitrariness of the rules of society. For the early scientists, Francis Bacon et al. the promise was the affecting of all things possible, using the experimental method and practical objectives, for the betterment of humankind. Early promises that have been realised in society include the reduction in working hours with the concomitant provision of more free time, which ironically we fill with the products of other scientific promises, those of technology – mobile phones, TV, travel. As we consider the impact of genomic science, the genomic promise is a global promise where investment flows globally and through decentralised networks. Is genomic science now in the position to take the promise of human enhancement/betterment to a new level? With genomics we may be entering a second renaissance. Like the original renaissance that put the individual at the centre of the political and cultural world, genomics offers the opportunity to recognise and discover our own individual uniqueness in a deep sense together with our relatedness to each other and to other species. From my own perspective, and reflecting on Nowotny’s ideas of promise and ‘betrayal’, it’s worth reflecting on that fact that the human genome project was funded off the back of such a promise – that benefits would be delivered upon its completion. That we needed the genome sequence goes without saying, but the fact that most scientists knew the answers would not (could not) be immediate was probably known to scientists in a way that it was not clear (or not made clear) to society, or the politicians ratifying the funding. Although we could ponder on whether a government would have provided the funding it did had it known it wouldn’t get immediate results. If the promise of science in society is one of expectation, I think it’s probably important to be careful managing those expectations. These begin with education about how science works, it’s pace and the absolute need to establish the fundamentals before we seek to apply discoveries to society. 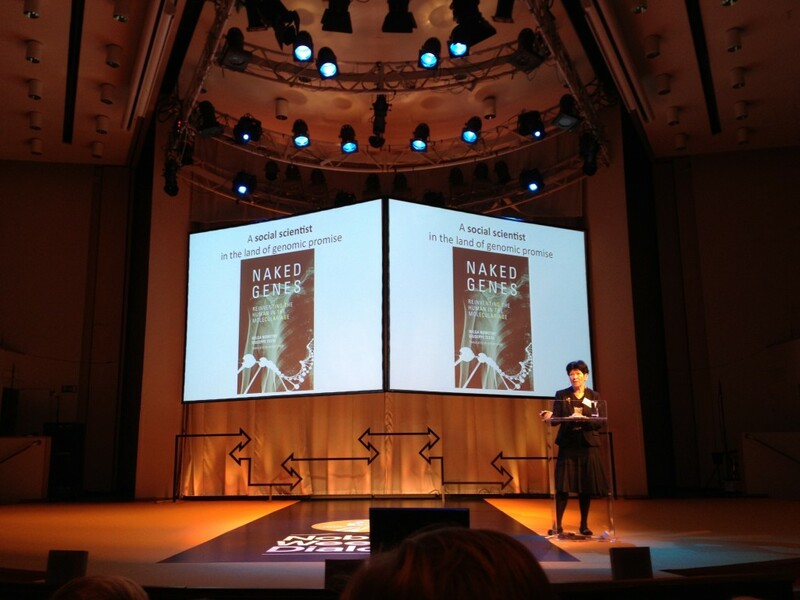 This post originates from the Nobel Week Dialogue 2012, where the author is a member of the official blog team. Follow the official event blog here.